Larks (Alaudidae) are distinguished from other songbirds by several characters. The back of the tarsus is rounded and covered with individual horny scutes on its rear side; unlike in all other oscines, where the back side of the tarsus is generally covered with one single and sharply edged scute. The lark's syrinx has no pessulus, or small cartilaginous knob at the point of fusion of the bronchiae. The pessulus is present in all other passeriform birds, with the exception of Funari-oidea and a few tyrannid species. Relationships within the Passeri remain uncertain. Larks are predominantly ground-dwelling birds; they evolved, however, from more arboreal ancestors. The recapitulation of arboreal habits can be observed during the development of juvenile larks. When leaving the nest before they can fly, they first hop on the ground like thrushes, but are able to walk within a few days just like their parents. Strong indications for their long adaptation to terrestrial habits are their courtship display and nest building on the ground, egg-rolling behavior, and distraction-display. When alarmed, larks first squat onto the ground, trusting their cryptic plumage to hide them instead of flying away. The terrestrial lifestyle of the larks is similar to that of pipits and wagtails (Motacillidae), but this is not due to common ancestry. 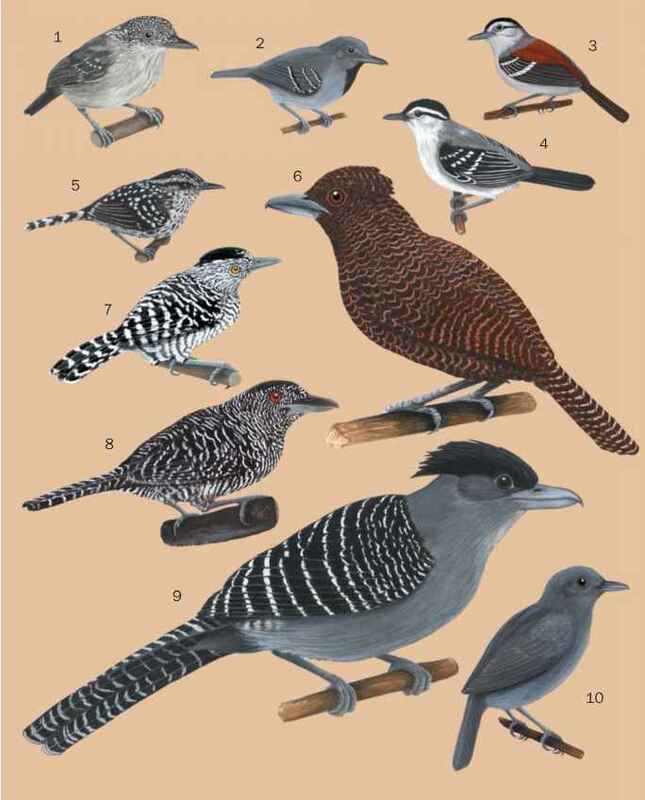 Motacillidae share with Fringillidae, Emberizidae, Parulidae, and Icteridae a sequence of nine additional nu-cleotides within a specific gene, a sequence missing in larks and in all other birds investigated. Fifteen genera of larks have been distinguished, and 78 species are listed in Peters Checklist, about a third of which are members of genus Mirafra. However, according to recent reinvestigations, including molecular, morphological, and behavioral studies, eight species should be added which had been thought to be subspecies. Members of the Alaudidae should not be confused with other birds commonly called larks: meadowlarks (Sturnella) belong to the Icteridae, the magpie-larks (Grallinidae) of Australia and New Guinea are members of the corvid assemblage, and the Australian songlarks (Cinclorhamphus) are thought to be Sylviidae.